Invoice history based on 75 reviews. At 1st Fix Maintenance Services we aim to resolve your plumbing, electrical, gas or building issues with the minimum of fuss and cost. At 1st Fix our main objectives are to provide a quick response to our customer’s needs, provide friendly and efficient engineers, a transparent charging system and have happy returning customers. 1st Fix will get your tap to stop dripping, your lights to stop flickering and the heat back in your home. If you are looking for an experienced electrician, plumber, plasterer, painter or handyman to attend to your property, then call us and we will be able to help. Here at 1stfix we are a family run business, between us we have over forty years of experience in the industry. We are a company providing a service for residential and commercial properties. We specialise in Installation, Emergencies, Servicing and every thing else in between. We are based in South London and have a large portfolio of happy residential and commercial clients across the capital. At 1stfix we feel that we are bringing a refreshing change to the building industry. We are committed to excellence and pride ourselves in creating the 1st fix, 1st time every time experience to all our clients. We demand the highest level of workmanship and always aim to provide outstanding customer service, this commitment has enabled us to grow rapidly by repeat and referral business. At 1stfix.com we offer a six-month no quibble guarantee on labour, this means if something goes wrong as a direct result of our engineers work, you can call us and we will send someone to assess the problem. If the fault is found to be ours, we will repair it and you wont have to pay any charges. 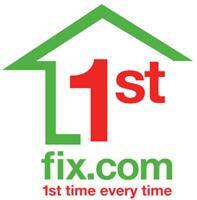 At 1stfix.com we accept all major credit and debit cards and we also accept cash or cheque.